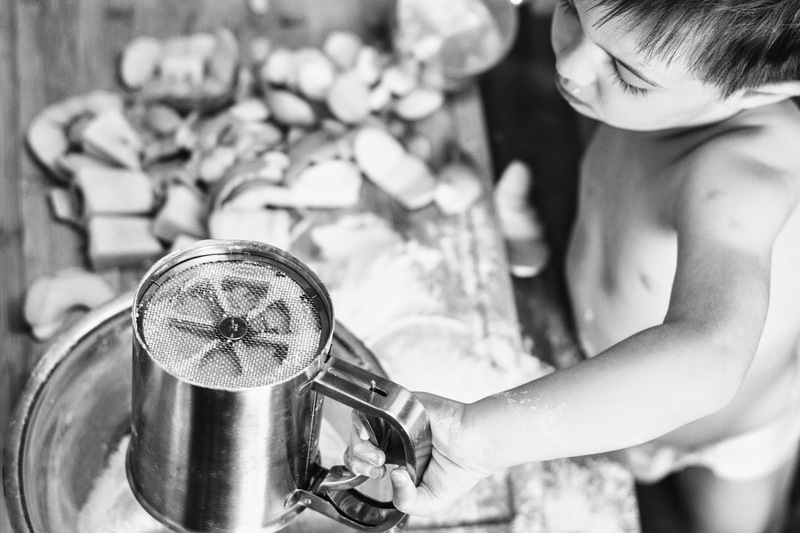 Matteo: Such a good helper in the kitchen, making twice the mess but also twice the fun. You have started referring to yourself in the third person, usually to assert your independence. When you don't want to do something, you say "Ma-ma do it" and when you want to do something all by yourself you say "Ma-ta-to do it." How cute is it that you call yourself Matato (rhymes with potato)? I just love it. Your sentences have really started to expand, too. You command "Turn the wa-ter on!" whenever you see the washing machine. Yesterday, you kept saying "BANK! BANK!" and when I finally asked you what you were going to do at the bank, you said "get mo-ney." How you know that, I have no clue. I think it must be from one of your books, because we really haven't gone to the bank in months. You also say "bake a cake" every time you see the mixer in the kitchen after you helped me bake an apple cake. You loved the whole process, from picking the apples off of our little tree, to the pouring, mixing and shaking of ingredients. Having you help in the kitchen has been my favorite activity this week, because you are so happy as long as you're engaged in something. Your tantrums are terrible when you're bored, so having you happily involved with the joy of baking is priceless. You definitely enjoyed the eating part of the process, too!